Have a thankful Memorial Day, y'all. Thankful! That's the adjective I was looking for. "Happy Memorial Day" just doesn't sound quite right. But why does Omar look so much like Fred Gwynne? If Bradley was as popular as Herman Munster, you'd be asking the inverse of your question. I studied his photos on Google and worked it out from there. I guess everybody has a twin. It was a good thing Gen. Bradley was on our side. As usual when I see quotes like this I do a quick search to learn more. Oddly enough, Bradley was the general who had to fight in Korea with limited and outdated equipment because President Truman de-armed and cut back the military, especially the army, after WWII. And John's picture is spot on - he was a four star general until promoted to to General of the Army, which earned him his fifth star. Other five-star generals were: George C Marshall, Douglas MacArthur, Dwight Eisenhower, and Henry "Hap" Arnold. There were so few because the "General of the Army" was reestablished in 1944 and was to wear five stars. Oddly enough, General Pershing was entitled to wear the 5 stars, he never did. 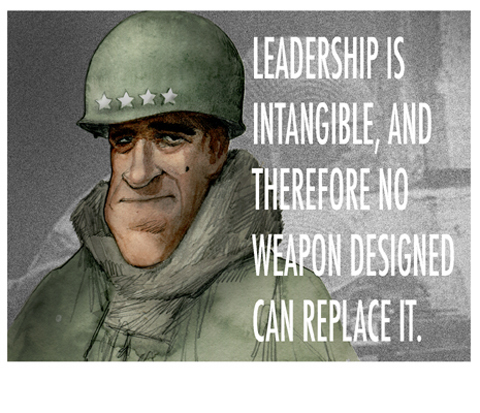 I'd have to say Marshall, MacArthur, Eisenhower, Arnold and Bradley were damn fine leaders. ...& God comfort the families & friends of the fallen. This is not my first time here, and again you know what you're doing, keep it. What's Taking place i'm new to this, I stumbled upon this I have found It positively helpful and it has aided me out loads. I'm hoping to give a contribution & aid different customers like its helped me. Great job. I'm just looking for some time information. After 6 hours of continuous Googleing Finally, I am in your website. I do not know what is Google's lack of strategy, not ranked in the top of the list of this information-rich site types. In general, the top site is garbagefull. In my opinion you are completely correct. This is among the most incredible blogs Ive read in a quite long time. The amount of info in here is stunning, like you practically wrote the book on the subject. Your weblog is great for any person who desires to comprehend this subject more. Wonderful stuff; please keep it up! Nice post! Your article is full of guider wisdom and really constructive. Thank you for sharing with more bloggers. Im a enormous fan already, man. Youve completed a brilliant job generating sure that individuals realize where youre coming from. And let me tell you, I get it. Wonderful stuff and I cant wait to read much more of your blogs. What youve got to say is critical and requirements to be read. Oh my goodness! Youre so correct! I actually dont believe anyones put it that way prior to! You should be an expert on this due to the fact you just made it so simple to comprehend, created me wish to understand much more about it! Do you, like, study this subject because you seem to be so in tune with the issue? Maintain it up, man. Youve got a great mind for it! This is, therefore, a combination of electronic and mechanical measurements. All the measurements are transferred and documented via wireless data transmission. This page contains a single entry from the blog posted on May 29, 2011 4:45 PM.